September and October have now become the months that one interviews for the internal medicine sub-specialties. For years I have been a fan of using my daily commute and extended travel times to “read” audiobooks or listen to medical lectures. 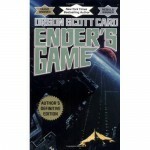 I have been on the road over the past two months and decided with my last trip out of state to break up my MKSAP study with a leisure novel – Ender’s Game. This will not be a book review. I am neither well-read enough to make insightful comparisons nor well written enough to write a critique to far outside my comfort zone of technical writing. One idea did come to me as I sat in the parking lot after arriving at work, listening to the final ten minutes of Orson Scott Card’s commentary. He emphasizes that this (the audiobook) is the medium that he would most like his stories to be shared. What do your family road trips look like? I realized instead of drop-down dvd screens or mp3 players loaded with the latest pop superstars, maybe I will, at least try, listen to audiobooks with my family. How great to have the opportunity to pause the story so that your children can share their insights or questions. What better way to introduce literary analysis and fundamental concepts of simile, metaphor, comparison, and antagonism. Why not make that road trip as productive for my family as I make my daily commute or interview trips? One faculty member asked recently whether I did anything that wasn’t purposeful after reviewing my hobbies. Interesting that is my most recent attempt at a purely leisure reading experience, I may have altered one vision I have for my family. I love surprises like that. As promised, this is not a book review. I do owe Card a brief analysis on whether the audio novel would be appropriate for a preteen family road trip. Given that the main characters are all preteen for the majority of the story, the language is pristine, and the dialogue is clear, I think that a first grade through junior high audience will be able to follow along without difficulty. For the adults, the characters are well-developed and plot line is engaging enough that you’ll reach for the next cd instead of hitting scan to find the local fm mix station that no one like but everyone can tolerate. This entry was posted in audiobooks, review, Travis Osterman by Travis Osterman. Bookmark the permalink.